1. Used in the expression “to the hilt”: to the maximum extent; fully. 2. 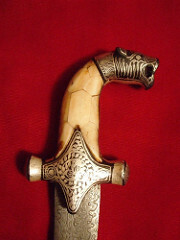 A handle, especially of a sword or dagger. From Old English hilt/hilte. Earliest documented use: around 1000. Music Keeps the Party Going; The Times of India (New Delhi); Mar 13, 2012. See more usage examples of hilt in Vocabulary.com’s dictionary.